Sorta politics...does the GOP know they've (accidentally?) subsidized BMW and presumably other non-MURRICAN SUVs? Yes, I’m apparently the kind of guy who is connected on Linkedin to the sales person who sold him a BMW one time. But hey, now I get to learn about this amazing GOP tax incentive for Bavarian (by way of South Carolina) SUVs. Even the dumbass X6 qualifies! UPDATE: I went and found the full text of the bill. The formatting is a mess and the only thing I could find is in relation to the depreciation deduction amounts on sub-6,000 lb GVWR passenger vehicles, which have all been raised. Here’s what I found, with the formatting cleaned up. 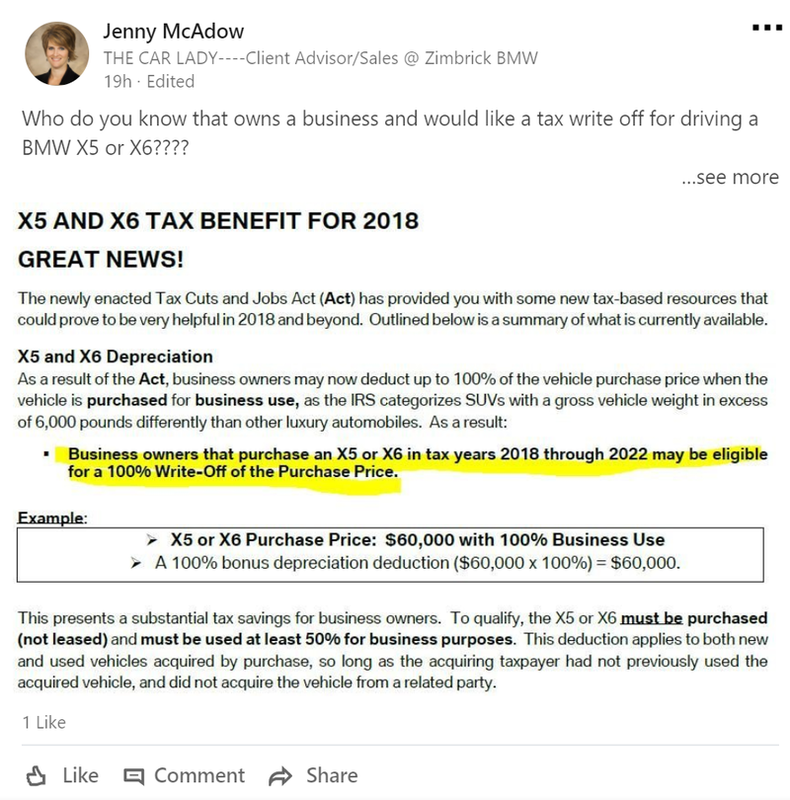 The “Hummer deduction” is in a different section where businesses can deduct up to 100% of the value of a vehicle over 6,000 lbs, depending on how much of the use of the vehicle is “for business.” Most people deduct something less than 100% of the value in order to not get too much attention. For vehicles under 6,000 lbs GVWR, there are limits on how much depreciation of that vehicle can be claimed as a deduction. The new tax bill significantly raises those limits. But...that doesn’t apply to the X5 and X6 which are over 6,000 lbs GVWR. Section 280F(a) limits the annual cost recovery deduction with respect to certain passenger automobiles. This limitation is commonly referred to as the “luxury automobile depreciation limitation.” For passenger automobiles placed in service in 2017, and for which the additional first-year depreciation deduction under section 168(k) is not claimed, the maximum amount of allowable depreciation is $3,160 for the year in which the vehicle is placed in service, $5,100 for the second year, $3,050 for the third year, and $1,875 for the fourth and later years in the recovery period. This limitation is indexed for inflation and applies to the aggregate deduction provided under present law for depreciation and section 179 expensing. Hence, passenger automobiles subject to section 280F are eligible for section 179 expensing only to the extent of the applicable limits contained in section 280F. For purposes of the depreciation limitation, passenger automobiles are defined broadly to include any four-wheeled vehicles that are manufactured primarily for use on public streets, roads, and highways and which are rated at 6,000 pounds unloaded gross vehicle weight or less. In the case of a truck or a van, the depreciation limitation applies to vehicles that are rated at 6,000 pounds gross vehicle weight or less. Sport utility vehicles are treated as a truck for the purpose of applying the section 280F limitation. Basis not recovered in the recovery period of a passenger automobile is allowable as an expense in subsequent taxable years. The expensed amount is limited in each such subsequent taxable year to the amount of the limitation in the fourth year in the recovery period. SEC. 13202. MODIFICATIONS TO DEPRECIATION LIMITATIONS ON LUXURY AUTOMOBILES AND PERSONAL USE PROPERTY. (D) in clause (iv), by striking ‘‘$1,475’’ and inserting ‘‘$5,760’’.